Hello, I am new to the site and RVing in general. I have just purchased a 1998 Sunline T-2363. I have seen the trailer but it is in another State and I need to tow it home. My tow vehicle is a 2013 Ford F150 with factory towing package excluding hitch ball. I would like to pre purchase a system with weight distribution and sway control but am having difficulty discovering the specs needed to make a decision. All recommendations are welcome. Welcome and congrats on your new 2363! This means you should look into weight distributing systems in rated for about 750 lbs of tongue weight. This is a pretty standard size, so you shouldn't have any problem finding a system to meet your needs. Sway control systems can really vary in price and effectiveness. The most basic is a friction sway control attachment. This is an ok setup, and for your size trailer, it would work. Many people who have bad experiences with these had them installed new on too large of a trailer, and friction sway controls just aren't effective on slide out trailers or really long trailers. This system is added to weight distribution and operates completely independently of it, so it's a popular choice for small trailers that don't need weight distribution. Pretty much all other sway control options are integrated with the weight distribution, and for all budgets. Equal-i-zer, Reese Dual Cam, Blue Ox, and Hensley, among others, all make it an all in one system, using their own unique designs. We have enough people here with experience in all systems that we should be able to help answer system specific questions, but Reese Dual Cam and Equal-i-zer seem to be the more popular choices. Thank you very much. I didn't think it was overly complicated and appreciate the guidance. Welcome! And congrats on your new Sunny!!! The T-2363 is a popular floor plan. Nice camper. As Sunline Fan stated, there are various brands and types out there. I do agree a 750 to 800# rated WD hitch would be the size you want/need as far a weight rating for your 1998 camper. That camper though is lower to the ground then some of the other Sunlines. That is unless the prior owner raised the camper by doing an over/under axle conversion. They move the axle tube from below the leaf springs from the bottom to the top. This would be something you should know before buying the WD hitch as it can change a few options. The reason I bring this up is, you will need a far size drop WD shank to get down low enough to be hitched up and have the TT tow level. That is a detail to work through regardless of which brand you buy. We can help you figure this out if needed, just ask and I'll type more. As to brands and types of WD hitches, for that lower riding camper I would suggest a trunnion bar style WD hitch as opposed to the round bars WD hitch. The round bar hitch will hang down lower and you may bump the hitch from time to time. The trunnion bar hitch is higher up on the camper frame. If the camper has been raised with the over/under kit, then we can look at round bar hitches. The tow ball coupler on the trailer should be 2 5/16". I am almost sure by 1998 all the dual axle Sunlines where on 2 5/16". Sunline Fan may be able to confirm that. You would need one that has a rating above the 5,500# of the trailer. They make a 10,000# rated tow ball that really does not cost much more than a 6,000# rated one and it may come in handy someday in the future if you upgrade campers. Just do not buy one yet until you sort out the WD hitch as the shank size where the threads are have to match the WD hitch head. There are links on that post to Etrailer.com which has several brands of 400 to 600# WD hitches. Or you can buy them locally from a hitch dealer. Those same brands/styles have 750 to 800# WD hitches that are better for your camper. And since your camper is larger, there are 2 more styles that can be added to the mix. 1. The Reese trunnion style WD hitch with the dual cam option can also be added. It will involve some some mores setup to work right but it is the best rated anti sway hitch they offer. 2. The Reese trunnion style WD hitch with the friction bar style anti sway bar option can also be added. A point to mention, the 2 Reese hitches listed above are made that they can be upgraded easily in the future if you buy a larger camper some day. You can reuse many of the same parts and just upgrade the spring bars. Not all hitches allow this feature. If you need/want help sorting through all those hitch details, just ask. Glad to help or to check what you have come up with. And thanks to all for an excellent resource. Is there a typo in the part number, "Equal-I-Zer 910042250" ? I cannot seem to find that as a good EQ part number. The closest to it is Equal-I-zer 91004250 High Performance Lubricant and that is not the hitch. Check and see or link us to what you bought. Hi John, trying to multi task. The correct Equal-I-Zer part # is 90-00-1000 (essentially a 1,000/10,000lb unit) with a 91006100 Hitch Ball. Yes, as far as I know, all Sunlines from 1997 and up use 2 5/16" balls. John will probably elaborate, but going overkill on the hitch capacity is not necessarily a good thing. When the bars are rated for more weight, they are stronger, which puts more force on the trailer. This could result in bending the tongue or frame, and just giving a stiff ride in general. If you can stop the order and order the smaller one, your towing experience will be better. OK thanks, now I got it. You are sort in the gray zone on hitch sizes. Meaning the different brands jump different sizes from small to large. In the Equal-I-zer brand, they offer 400, 600, 1,000, 1,200 and 1,400# hitches. They are a very good WD hitch, however they do not offer the ability to upgrade the WD bars between hitch heads. Meaning you have to rebuy the hitch as each hitch head is made to the ratings. For sure between a 600 and a 1,000# rated one the head changes. In the Reese brand, also a very good hitch, they offer more options. In the HP trunnion bar hitch line, they offer 600, 800, 1,200, 1,500 and then 1,700# WD bars. The actual hitch head is the same for all of them. The WD bars interchange. If you are ever going to the 1,700, then the hitch shank has to change to a 2 1/2" in place of 2" shank and the snap up brackets can be upgraded. So from 600 to 1,500# all the parts are the same but the WD bars which can be bought separate. The Reese issue is they do not offer a 1,000# hitch like they use to which sometimes is a problem, so the EQ fits better in those cases. Sunline Fans point about the WD hitch being too heavy rated (meaning the WD bars) for the loaded TW (tongue weight) can create a harsher ride on the truck. How much depends on how far away from the ratings. A 600# TW against a 1,000# WD hitch will have a level of stiffness to it. Another concern is the A frame on the camper. This is a more real one to be concerned about. Truck bed weight behind the rear axle in the truck works on the WD hitch depending on how the hitch is setup. If the hitch is set with an empty truck bed, and you add 200# of firewood loaded next to the tailgate, then that weight adds to the trailer TW creating more tension on the WD bars. If the camper is say 700# TW, then the 200# firewood, the hitch would see 900#. And in this case the 1,000# WD hitch would be just about right as far as the WD hitch. The problem is the camper A frame is now taking the 900# of spring bar. This one is a concern. I'm going out on a limb here but I suspect that 98 T-2363 has a 4" channel iron A frame. Many of the Sunlines of that weight range had them. And my own 2004 T-1950 has one. If it by chance has a 3" channel iron frame, we have a bid issue. When the 4" channel iron frame and the header setup that was used approaches the 1,000# loaded TW mark, there have been issues with the A frame header bending. The A frame flexes under the WD loads and that flexing can damage the header. This all comes down to the weights and the setting on the 1,000# WD hitch. The WD hitch has the potential to create the damaging forces. If the owner never loaded the system (truck or camper) to create those heavy forces or the hitch was not set for heavy loads, and you never towed much over large humps, like a RR crossing then you where more lucky to not damage the frame. But it is really luck, good or bad. A bad thing that ended up lucky, my 2004 T-1950 came from the prior owner with part of an Equa-I-zer 1,000# WD hitch when I bought it... and this camper is only rated to 5,500# GVWR. It has the 4" channel iron frame. I only have the L brackets and the WD bars. The hitch head and shank never made it. They towed it with an older Tundra I think. I will not use that large hitch. They were fortunate, it did not damage the A frame. However last fall I inspected a 2005 T-2363 for a friend and it had a cracked header. I never saw what WD hitch they used. The 2005, is setup on a 5,500# GVWR trailer like your 98. And we know about the 4" channel iron frame issues with the 2005 T-2499 frame redesign on a 7,000# GVWR which has higher TW's. It showed up on this T-2363 which had a 4" header. 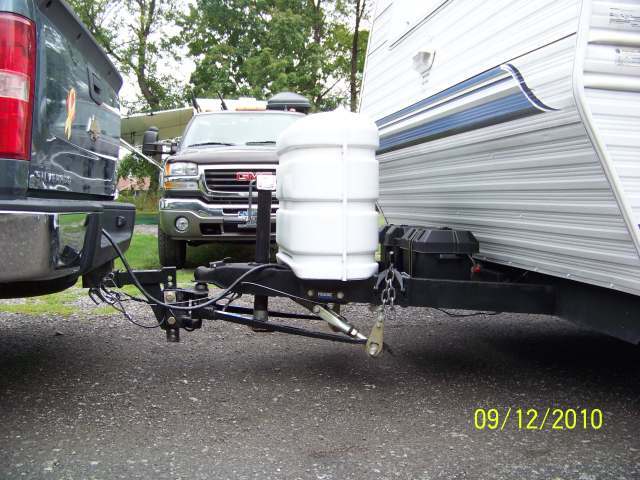 Point is, you may or may have a problem using a 1,000# WD hitch on that 98 camper. Knowing what I know, I myself would not use a 1,000# rated spring bar and I really cannot recommend it. So now what to do? As a friend and fellow camper, we are expressing caution for you. Knowing the history we know, using a 1,000# WD hitch on that camper has the ability giving the circumstances to create damage to the frame header and A frame rails over time. If you have the ability to change the order, we can help sort out what would work better. If you want to stay in the Equal-I-zer line, the 600# will just fit. You will have to watch you do not overload the front of the camper. When the time comes to change campers, then you can sell it on Craigslist as this is often done. While the 600# will just fit, a 750 or 800 gave extra room but not too much extra. The Reese HP trunnion bar hitch has the 800# WD hitch and can be upgraded later. You can use the friction bar or the dual cam for anti sway control. This pic below is from a 2005 T-2363 from a fellow club member I helped him set up his hitch at a Meet and Greet. He had a Chevy 1500 with the Reese HP trunnion bar hitch, 800# WD bars, the Dual Cam and a 6" drop shank to get down to the camper. The DC and this lower frame is the limit that it can work and not drag the ground, but it will work and it will take some time to adjust it so it all works right. Your F150 would be similar. If you do not want the DC feature you can add a friction bar and always add the DC later if you get a bigger camper. The DC is sold as an add on if wanted. Your 98 camper would be similar. I cannot tell if the 98 had 14" tires or 15" tires. But the 2005 had 15" tires and it needed a 6" drop shank to get down to the camper. Sorry this complication came up. We are here to help. Good to know you have this sorted out. Anything you need help on the camper, this is the place to come. Camper, truck , camping just about anything and someone can help. Odds are high you may need a new longer WD shank. Yes the standard one will work to get you home, I think the standard may be a 3" drop shank. Being that nose high all the time will take its toll over time on the unequal axle loading. And in some cases, nose high by a lot can create a towing instability when high winds come. Also in case you did not know, the Equal-I-zer hitch requires a thin wall socket to tighten the ball nut. The normal 3/4 drive socket does not fit in the hitch head.